Chicken Pesto Pizza. It’s basil season soon. This year, I’ve just started my seeds. I’m about a month late because our weather has been a bit colder than expected. And, I had to decide whether or not I wanted to plant basil. Last year, our basil succumbed to basil blight. Because I want to eat my Chicken Pesto Pizza again, I went ahead with my plantings! 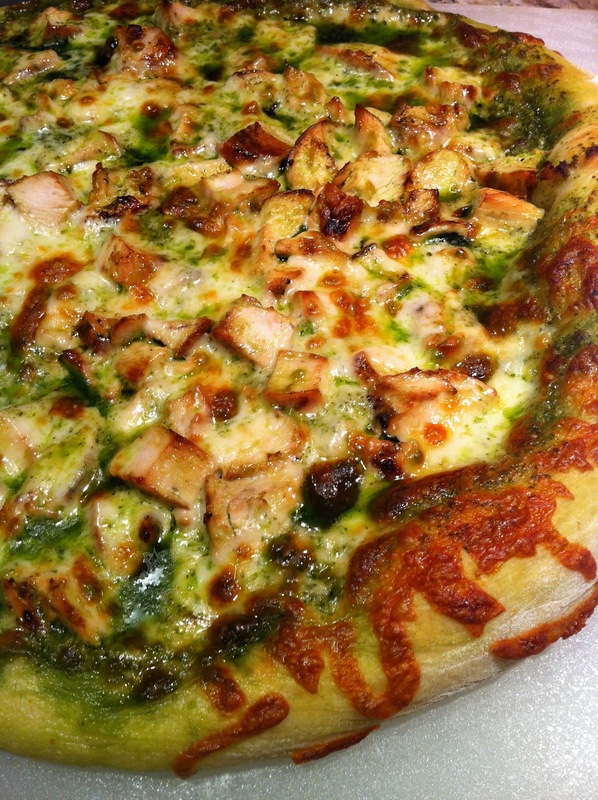 This chicken pesto pizza is a great way to use an overabundance of basil. 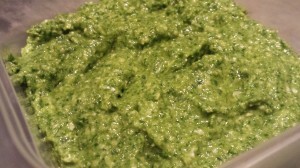 Just make a pesto such as my basil arugula pesto, and you’ve got a great sauce base for a pizza. I like to use a pizza stone if possible. You can grill this pizza on your BBQ grill. Or just bake it in your regular oven on a nice pizza pan . 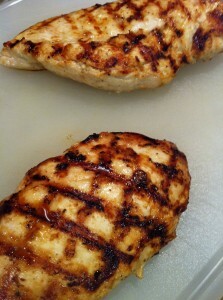 And you can grill your chicken or just poach it in a chicken broth until cooked. Roll out a pizza dough and transfer to a greased pizza pan or preheated pizza stone. 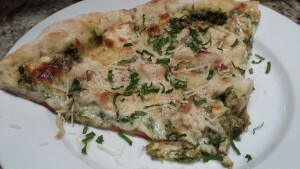 Spread out the pesto on the dough with a spoon. 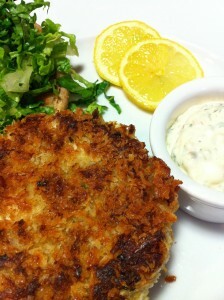 Add some chopped cooked or grilled chicken, a sprinkling of mozzarella and parmesan, a few sliced garlic cloves and bake! Garnish with some chopped basil, pine nuts, and additional parmesan. 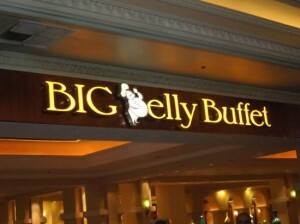 This is one of my favorite pizzas! Hope it becomes a favorite of yours, too. 2. Roll out the pizza dough on a lightly floured pastry board and transfer to a greased pizza pan or preheated pizza stone (follow the pizza stone manufacturer’s directions). 3. 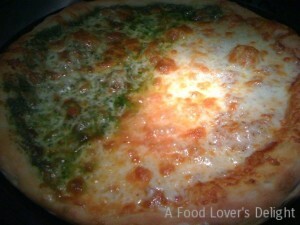 Spread out the pesto on the pizza dough, using a spoon, and being sure to spread almost to the edges of the dough. 4. Sprinkle the pesto with half of the mozzarella. 5. Add the chicken pieces and optional sliced garlic evenly across the mozzarella. 6. 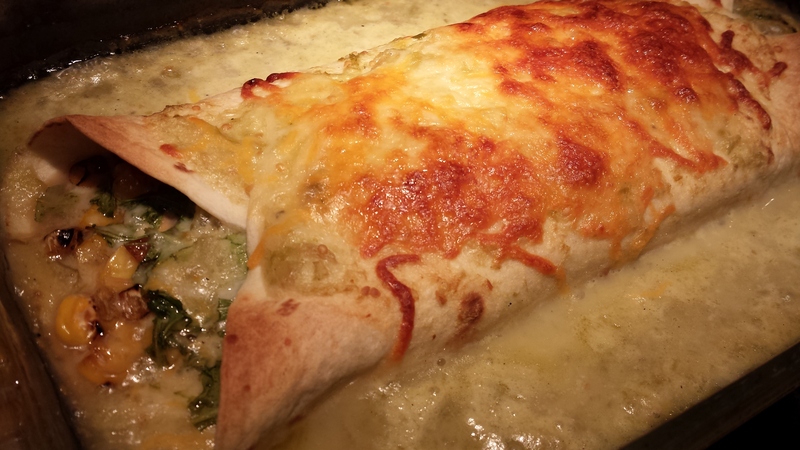 Top with the remaining mozzarella and the Parmesan cheese. 7. Bake the pizza for 10 – 12 minutes. 8. When the pizza is done, and the cheese is melty and bubbly, and the crust is slightly browned, remove it from the oven and let it sit in the pan for a few minutes. 9. When the pizza has cooled a bit, cut it into pieces. 10. 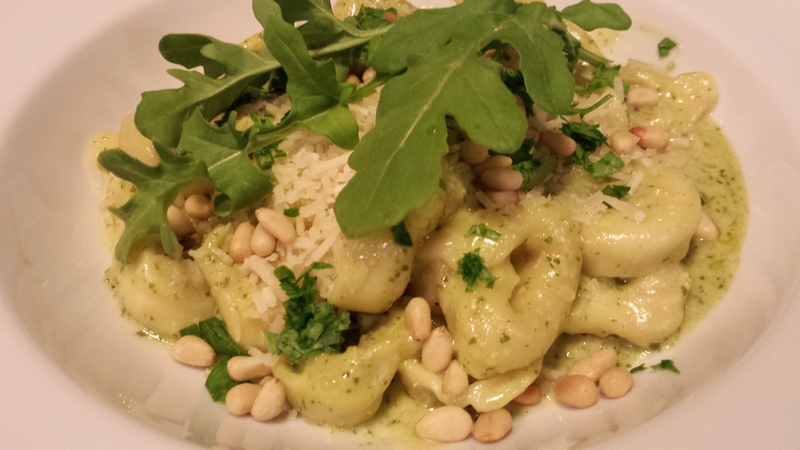 Garnish with the basil, optional pine nuts and additional parmesan. Serves 4 hungry pizza eaters. Offer with a side salad such as my Colorful Confetti Salad. 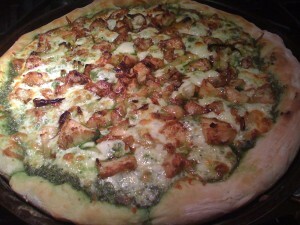 Variations: Omit the chicken for a vegetarian style pizza. Omit the pine nuts. Use your own favorite pesto. Substitute chopped prosciutto for the chicken.